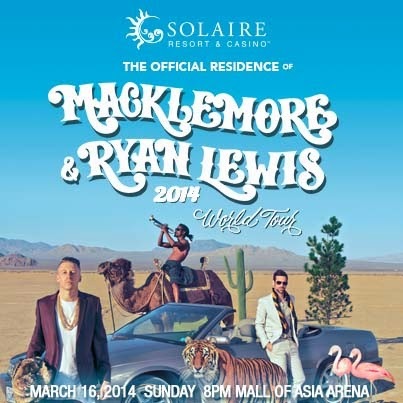 Solaire Resort and Casino will be the Official Residence of Grammy 2014 Best New Artist Macklemore and Ryan Lewis. They will perform at the SM Mall of Asia Arena. Catch Macklemore and Ryan Lewis 2014 World Tour on March 16, 2014 (Sunday) 8PM.